Grand Hyatt Muscat, Shatti Al Qurm PO Box 951, Postal Code 133, Muscat, Sultanate of Oman. +968 2464 1234. Samah Rooftop Restaurant, The Platinum, Muscat Souq Al Khuwair Street, Muscat, 112. 1860 500 2121 (Call Center Hours). Rooftop restaurant offers views over the centre of Muscat. Alcohol-free. Swiss-Belhotel Al Qurm, Oman. Rooftop speciality restaurant and bar offering spectacular views, cigar lounge. Twin tower complex connected by a footbridge on the top floor. The Pub, 8th floor, Hotel al-Falaj, Al-Mujamma St, Bait Al-Falaj, Ruwi, Muscat, Oman. +968 2470 2311. Sat to Thurs 1pm to 3pm. 6pm to 2am. Albahr, in Mina Hotel, Corniche Roundabout, Ruwi, Oman 112. 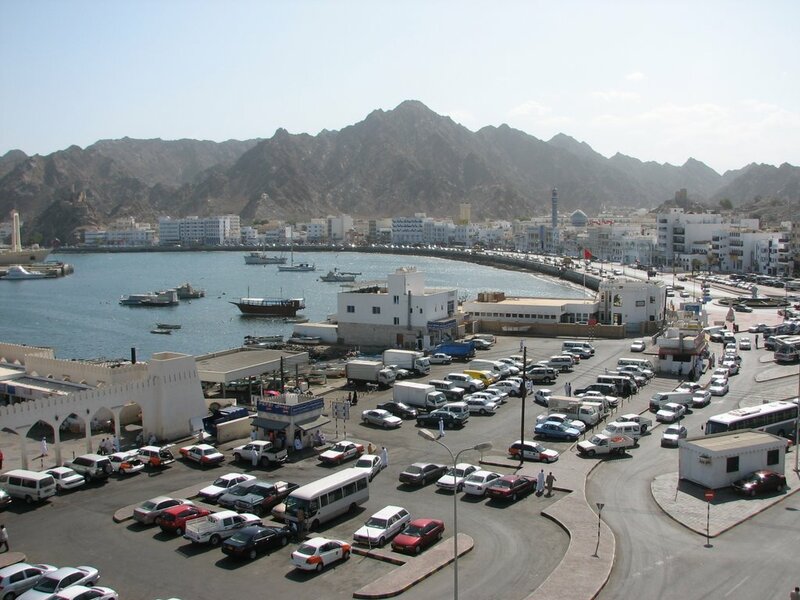 +968 2471 1828 Great view of Mutrah port. Al Marjan, 4th floor, Al Bustan Palace, A Ritz-Carlton Hotel, PO Box 1998, Muscat 114 Oman. +968 24 79 9666 Daily 5pm-1am. Al Khiran, AL BUSTAN PALACE, A RITZ- CARLTON HOTEl , PO Box 1998, Muscat 114 Oman. +968 24 799666 Overlooking Sea of Oman, the award winning is the all day indoor and outdoor dining restaurant. Serving a scrumptious buffet breakfast and an international lunch buffet with live cooking stations there is plenty of choice for everyone. For dinner, guests can enjoy the special themed buffet nights on a daily basis. An a la carte menu is also available. DWAV Breakfast 7 a.m. to 11 a.m. Buffet Lunch 12 noon to 3 p.m. Theme Nights Dinner 6:30 p.m. to 10:30 p.m. BEACH PAVILION A la Carte Lunch 12 noon to 3 p.m. Bar Snack Menu 12 noon to 11 p.m. A la Carte Dinner 7 p.m. to 11 p.m. As a courtesy to the local culture, all our restaurants observe a Smart Casual dress code in the evening. Please refrain from wearing flips-flops, tank tops, athletic apparel and backpacks, as well as sleeveless tops for gentlemen and denim shorts for ladies. Long trousers and closed shoes are required for gentlemen. Walking barefoot is not allowed at any times in all restaurants. Al Hedayet International Restaurant, opposite Qurum complex Second floor roof-top gives a spectacular view of the Qurum area. Sheraton P.O. Box 3260, Masqat 112, Oman. +968 24 772772. Closed.